Do you love to sew? Do you wish you could make a living off of your sewing projects? The book Sewing to Sell: The Beginner’s Guide To Starting A Craft Business is a practical guide that will help you turn your passion into a profitable home business. 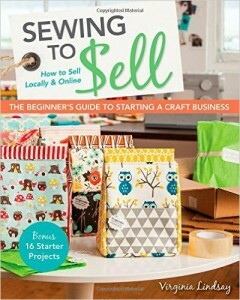 Written by Virginia Lindsay, this is a book that can show you how to sell your sewing projects locally and online. Plus, the book features 16 bonus starter projects to help you launch your business. Sewing to Sell aims to be a complete guide for an experienced seamstress that wants to make a living off of their passion. Virginia Lindsay includes everything you need to know to get started in this detailed, thorough book. One of the first and most important things that the author teaches you is how to find your sewing style. Every seamstress has their own unique style, which is what sets their products apart from others. Finding your own style will help you stand out in the crowd, and will be what attracts customers to your line of products. This is one of the most important aspects of starting your own sewing business because if you cannot be individual or unique, you’re not likely to be successful. All of these aspects are incredibly important. It all starts with creating your own line of products, which the author shows you how to do step-by-step. Next, learn how to identify your customers, which will make it easier to market your work to the right people. All of this information will allow you to confidently start your new sewing business. The author also shows you how to design your own patterns, so you can offer unique products that customers will love. Additionally, you may also choose to sell these patterns to generate extra income. Designing your own patterns will give you a leg up on the competition, but this is not an easy process. The author offers tips and tricks to help you create unique patterns that will take your sewing projects to the next level. One of the great things about the starter projects is that the author already sells versions of these products in her own online store, so you know there’s demand for these items. If you’ve always wanted to start your own sewing business but didn’t know where to start, these projects will start you off on the right foot. In addition to her projects, the author also includes interviews with others successful craft-based business owners. This gives you the chance to learn more about the business from people who have firsthand experience. On top of all this information, the author also walks you through the process of selling your items at local craft shows or online. If you’re just getting started with sewing, this book may not be as useful to you right away. The author created this book with experienced crafters in mind – those who are looking to take their passion to the next level. That said, if you’re looking for a book that covers all aspects of starting your own sewing business, Sewing to Sell: The Beginner’s Guide To Starting A Craft Business is the ideal choice for you. thank you Jessie! This is a really thorough review and I appreciate the time you took. I am so glad it has been helpful to you! Is this book available digitally. I live in Saudi Arabia and it can take months for orders to arrive. Yes, there is a Kindle version available too.